Atletico were unlucky again as Real Madrid beat Diego Simeone’s side in the UEFA Champion’s League final twice in three years to claim their eleventh Champions League title. The UCL Final was a scrappy affair to say the least for most parts. The goal came early this time for Real Madrid who had to thank Sergio Ramos for his shuffling the ball in from a set piece flick on by Gareth Bale. Atletico had a chance to level it up as Fernando Torres won a penalty for his side right after half time which Antoine Griezmann ended up missing the spot kick. Real Madrid chose to sit back and allow Atletico to break them down which seemed to be working like a charm till Yannick Ferreira Carrasco came on. His pace and trickery sent everyone scrambling. The goal came from a fine run of play which saw Juanfran deliver a peach for Carrasco to score. The two teams then fought through to the end of extra time to find themselves shooting penalties. Keylor Navas did make a few saves but his crowning glory was the penalty where his mind games were enough to unsettle Antoine Griezmann. Dani Carvajal seemed to be in total control of his side till injury forced him off. As he tearfully went off, so with him did some part of Real’s stability on that side of the pitch as his replacement seemed to be under all sorts of pressure. Pepe, the less said the better. He nearly threw away the game by offering Atletico a way back in by handing them a penalty, mainly by being careless. Some of his antics on the pitch were great entertainment value at best. 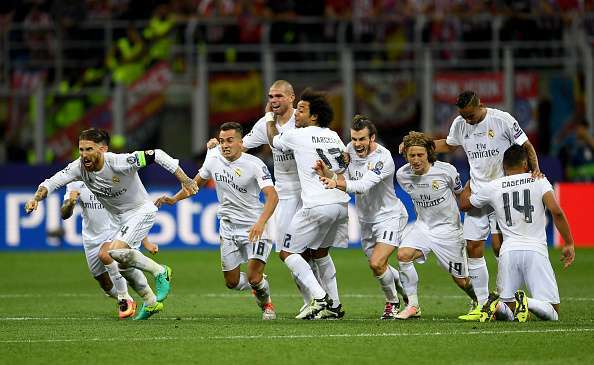 Sergio Ramos loves a UCL final, except for when he was to defend. He scrapped the ball in after a Gareth Bale flick on from a Toni Kroos corner to make it two goals in his last two UCL final appearances. Ramos scored in the shootout as well. Marcelo had a quiet game by his standards and was left for dead by Juanfran for the equalizer. He slotted in his penalty coolly. Casemiro kept the shape in that Real Madrid midfield and often mopped up. His discipline was key to the shape Real kept while they soaked in the Atletico Madrid pressure with the Rojiblancos chasing the game. For a better part of the game, Modric had a tidy game where he played the perfect foil from deep to Toni Kroos’ movement up and down. He did, however, fade as the game went into extra time. Toni Kroos was stellar for the Real midfield as he kept threatening when on the ball and was disciplined when off it. He was eventually taken off to make way for Isco. Gareth Bale seemed to be the true attacking threat for Real in this game as Cristiano Ronaldo blew hot and cold and Benzema didn’t seem like he had much to do. For most parts, he was frustrated by some excellent defending but his flick on for the goal was invaluable. He slotted in his penalty. Cristiano didn’t really manage to put in a vintage performance on the night and for most parts seemed to be a completely forlorn figure on the night. Cristiano would probably not have remembered this game for much had he not scored the winning penalty in the shootout which handed them the trophy. Another player who seemed to have done little to impact the game but often was used in the buildup to some of Real’s attacking play. He was taken off late in the second half. Isco kept things neat after coming on for Toni Kroos and did offer an attacking threat for a while. Lucas Vazquez came on for Benzema late in the game and had some great movement to his credit. Scored his penalty. After a bit of an unsure start, he seemed to be relatively at ease as the game wore on. He came on for an injured Dani Carvajal early in the second half .